Carry bag: Makes it easy to carry the headband headphone with you anywhere. 3.5mm earphone jack: Compatible with most mp3 player, smartphone, tablet, PC etc. 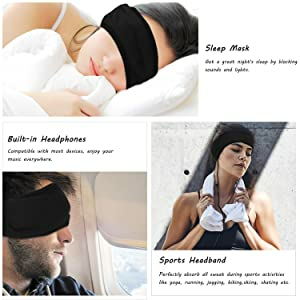 ★★★★★ AGPTEK sleep headphone is a corded headband that adopts breathable Lycra fabric, mesh lining and ultra-thin speaker, which is suitable for sleep aid and sports. 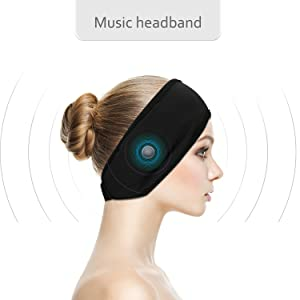 You can wear the sleep headphone to listen to music, audio books, podcast, ASMR etc. Newly upgraded with ultra thin speakers and durable braided cord. These luxurious sleep headphones provide the ultimate in comfort for sleeping, relaxing, or meditation. It may also be used as a sleep mask by simply pulling it down over your eyes. Embedded speakers in a soft, fleece headband are completely adjustable for the perfect fit. 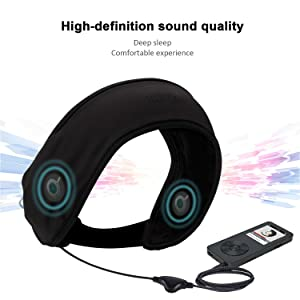 Super Comfortable Sleep Headphone: The exterior layer is made of soft and breathable Lycra fabric while the inner layer adopts mesh lining flexible fabric. Ultra-thin and comfortable, won’t cause much stress to your head. Hook & Loop Design: It allows you to adjust the headband to fit your head in different situation. Suitable for head around 17-22in. User-friendly: Independent volume control on the cable makes it easy for you to adjust volume at any time. Speakers can be adjusted and fixed due to a small cut on both sides. Fully Washable: It can be washed after you remove the headphones from the headband. Never worry about sweat or dirt. 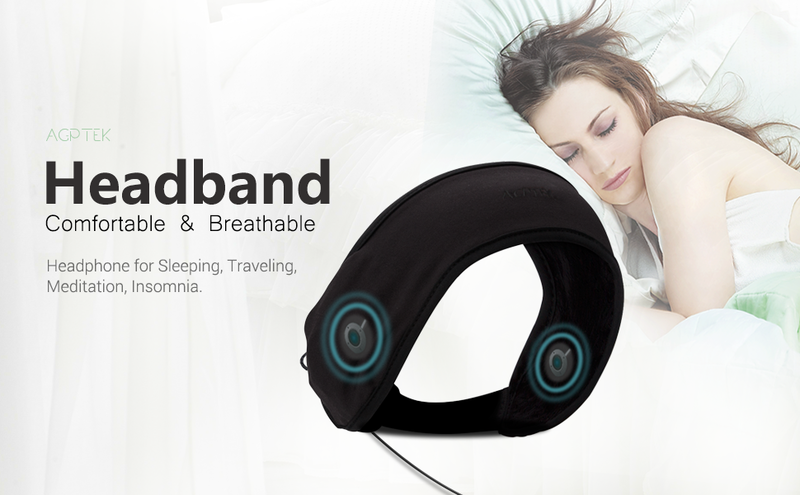 Versatile: The headband headphone is suitable for sleeping aid and sports. Perfect for gym, fitness, workout, exercise, outdoor sports such as running, skiing, skating, hiking, camping, dog walking, holiday travelling and so on. 1. The headband can act as an eye mask but it cannot fully block the light. 2. 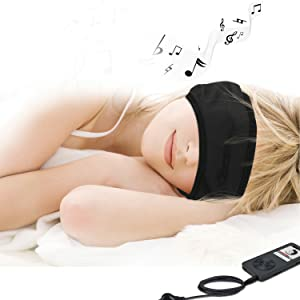 The speaker position can be adjusted and fixed as needed .The band don’t too tight or loose and please don’t move your head drastically when you try to sleep. If the sound is hard to hear or inaudible,please adjusted the speaker postion to close your ears. Hope it helps. Please come to us if you have any questions. The headband headphone is suitable for sleeping aid and sports. dog walking, holiday travelling and so on.Use for sports, yoga, meditation and relaxation. Kids love ’em too. Ideal for children, college students, dorm life, shared apartments, noisy roommates, snoring spouses and co-eds. to adjust the headband to fit your head in different situation. Suitable for head around 17-22in. remove the headphones from the headband. Never worry about sweat or dirt anymore. Lycra fabric won’t cause much stress to your head. makes it easy for you to adjust volume at any time. small cut on both sides. or anything with a 3. 5mm jack. Lightweight and washable with superior sound. The perfect accessory for traveling.